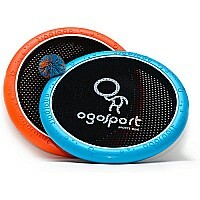 A 15" hand trampoline for balls: throw, catch, bounce! Invest in your child‘s health + mind with one of the world's best outdoor toys: the awarding-winning OgoDisk! 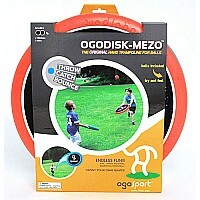 The OgoDisk Mezo combines a large target area for easy bouncing with a thinner handle for smaller hands. Bounce any ball – for summer fun, try it in the pool with water balloons! Set includes one bright-blue and one OgoOrange disk with one OgoSoft ball. EVA foam ring. Nylon-spandex membrane center. 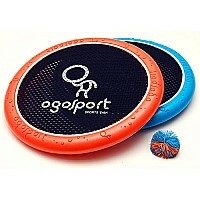 Measures approximately: 15.00 x 15.75 x 3.00 inches..